After a very busy Christmas period we can reflect on what has been a very joyful time of year for us. We had a brilliant sold out Christmas concert where all our groups performed for their family, friends and band supporters. 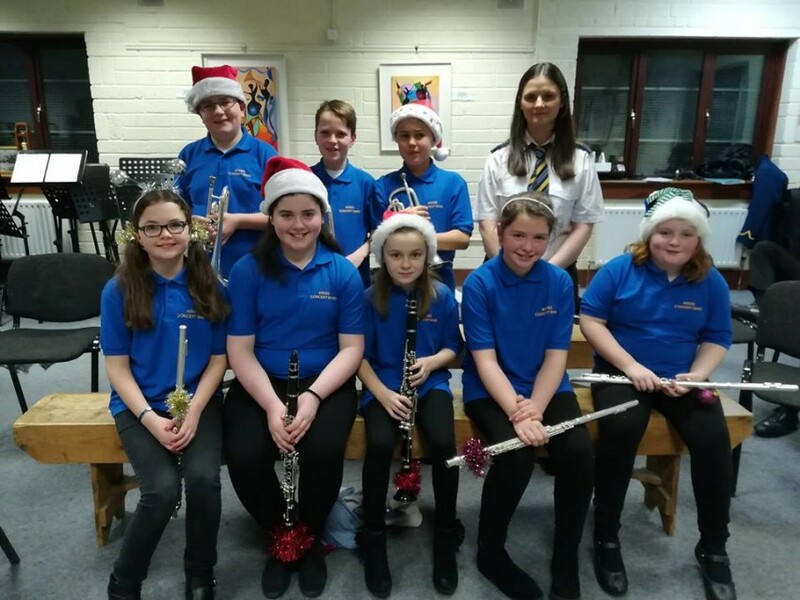 The Recroder Group, the Junior band, youth band and senior band all performed under their respective conductors to a packed out Bohemian centre and getting everyone into a festive spirit. 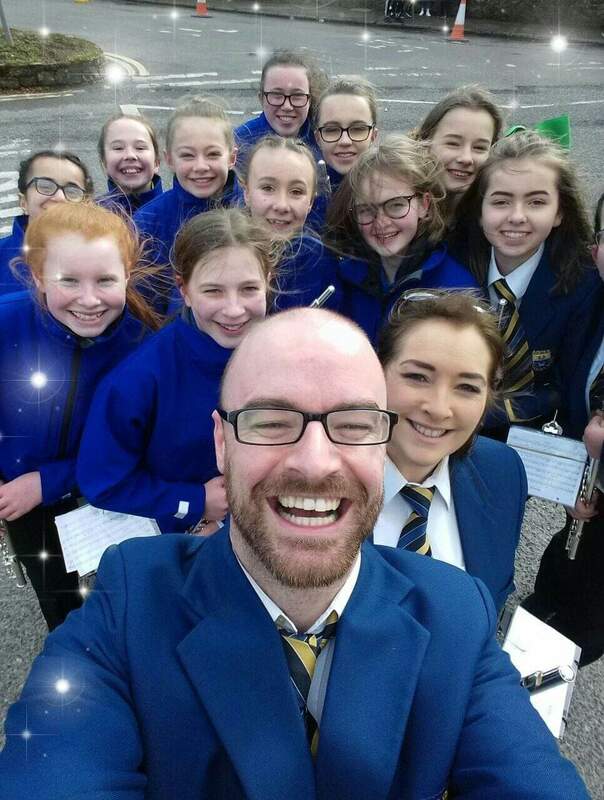 The senior band performed at the annual Parish Carol service and the parish school children along with parish groups serenaded the congregation in festive song backed by the band and their conductor Mr. James Mac Cafferty. On the weekend leading up to christmas many members took to the streets to perform Carol’s to everyone doing their last minute shopping and getting rhem through their Big hectic grocery shops for Christmas day dinner. Groups also gave song and music to residents of Moore hall lodge, Ardee also. Our conductor, James MacCafferty, with the magnificent Turner Challenge Cup which was awarded to Ardee Concert Band for our 1st Place in the Championship Concert Band Section of the 101stChampionship of Ireland Bands’ Contest held in the Market Place Theatre, Armagh, on Saturday 13thOctober 2018. 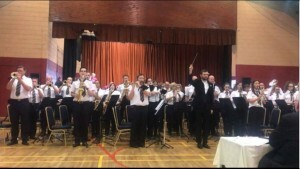 Ardee Concert Band held a very successful enrolment night on Monday 17th September. The band are enrolling young members age 8 and over to join their new Recorder Group which will start on Friday 28thSeptember in the band rooms on the Ash Walk, Ardee. New members will spend about eight months learning the recorder and then they will move to one of the band instruments, which are flute, oboe, clarinet, saxophone, trumpet, trombone, tuba, or drums. After four months, they will join the training band, then the junior band, the youth band and finally the senior band. The band would like to thank everyone who generously contributed to their recent church gate collection in Ardee and Ballapousta. 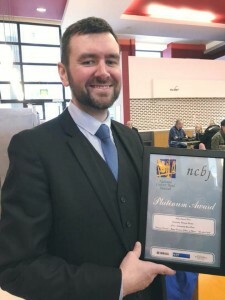 Community band Platinum winners again! Ardee Concert Band have just gone and won Platinum Again! Yes the highest award of the day; The Platinum award was bestowed on the Ardonians in the Finals of the National Concert Band Festival in the Royal Northern College of Music in Manchester on Sunday 8th April 2018 just before 11.30 am, that’s not bad for a Sunday mornings work! After an early start the band of 47 musicians took to the college of music stage and performed 4 pieces under the baton of their MD Brendan Breslin in the community wind band section. Partaking in an Irish themed programme they began with ‘Finnegans wake’ a song famous for providing the basis of James Joyce’s final work. They followed with ‘An Irish ayre’, A warm and lyrical composition. ‘Sarah’s Delight’ preceeded the finale of the winning programme. The winning penultimate piece ‘Gather the Gaels’, is a piece written for the coming together of wind, brass and swing bands from all over Ireland for the Gathering Of The Gales’ Festival In Strabane 2013. 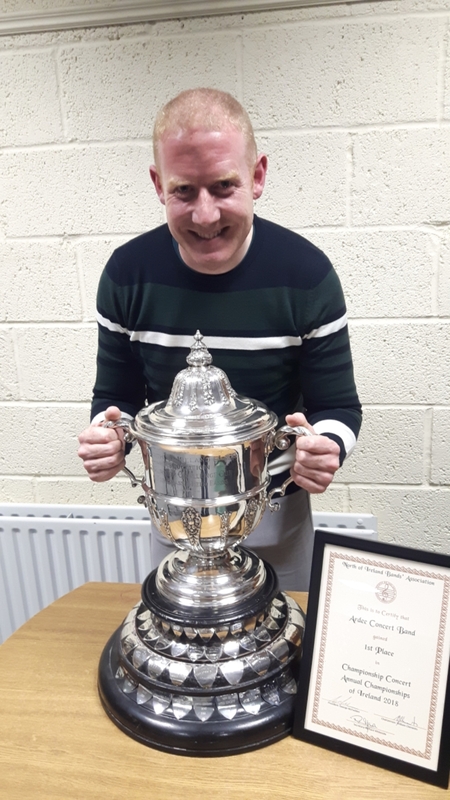 Ardee pipped Strathclyde University Concert Band and their MD Chris Mitchell to the post with their Scottish counterparts taking gold back up North. 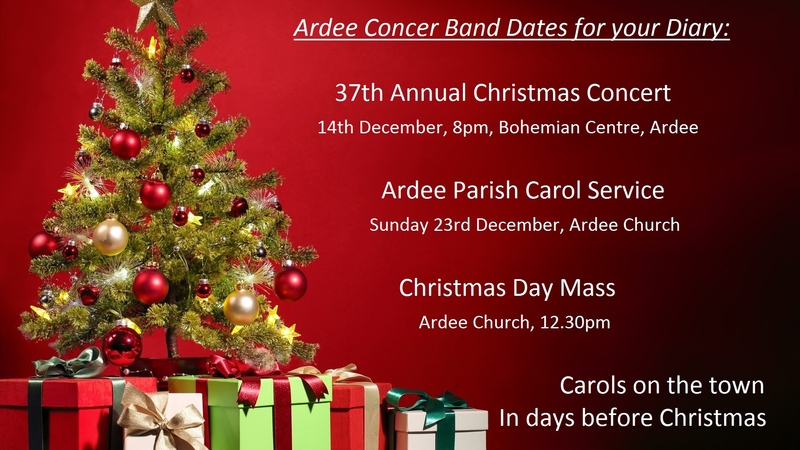 Friends to Ardee, Strathclyde hosted the champions in October 2015 in Glasgow for a penultimate concert in St Andrew’s in the Square with Ardee returning the gesture in 2016 in the Bohemian Centre. Returning in the early hours of Monday morning after a long ferry crossing home the band were greeted at the Bandrooms on Ashwalk with banners and balloons adorning the building to celebrate their huge efforts and success. 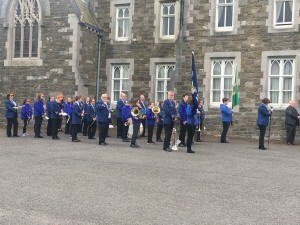 On Sunday, May 20th Ardee Concert Band took Part in the Parish May Procession. 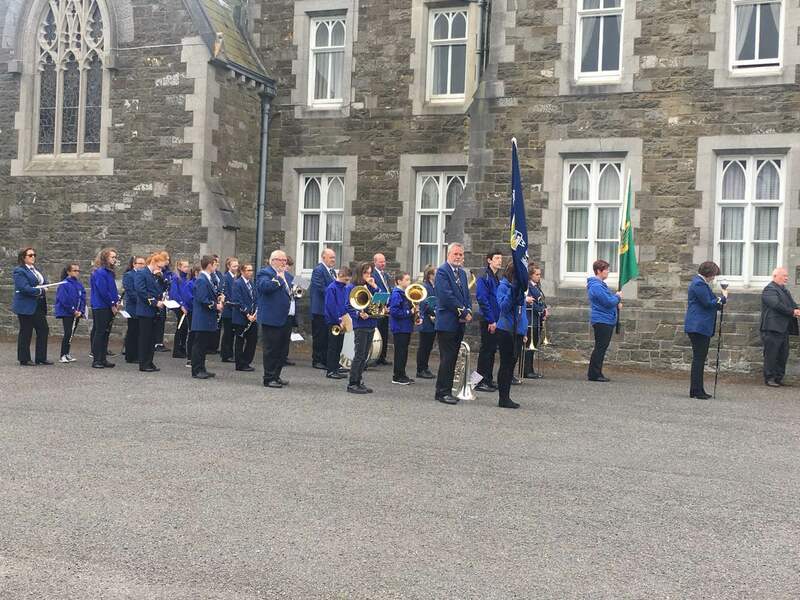 The band led the Procession setting off on a slow march just before one o’clock from The Church on the Nativity, playing hymns to honour our Lady, Queen of the May during the interludes of Our Lady’s Rosary. Upon the Arrival of the Procession to The Convent of Mercy on Hale Street, Everyone involved: Young and Old took part in the Benediction, led by Fr. O’Leary, joining in on the hymns and prayers. The Band closed the sacred occasion by playing Faith our Fathers, Conducted by Kevin Reilly and joined in song by the whole Congregation. QHappy St. Patrick’s Day from all of us at Ardee Concert Band! We led our local parade here in Ardee as we always do today with combined Youth and Senior Bands at 3pm in the freezing cold weather. Band Members met at the Band room at 2pm in full uniform; over many many thermal layers, to set up and file into ranks to march to the Fairgreen where the parade started and headed south to William/Half St to Disband. We roared on Ireland for the Grand Slam win in Twickenham from our bandroom recreation room while we tucked into pizzas and chicken pieces and a mineral after working up a thirst on the march; even if it should have been hot chocolates all round to warm us all up. 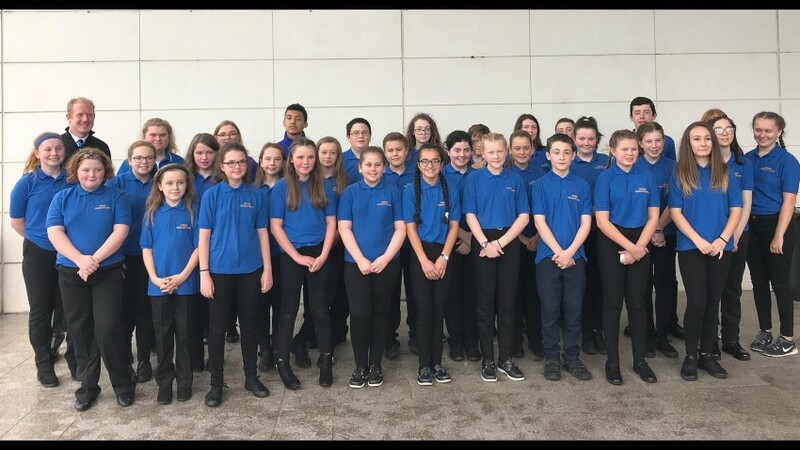 Last year 2017, was the very first year that both bands combined and all of the members and especially the members of the Youth Band performed really well on the day. It is a great honour for our band to lead the Ardee St. Patrick’s Day Parade each year. This parade was organised for many many years by the band and the band has always lead it, ever since the first parade in 1969. The parade is our biggest audience each year with in excess of 5,000 people watching each year. Well done to everyone who took part, especially the members of the Recorder Group who were on the stage for the first time. Another lovely event that went very well on Sunday Dec 17th 2017. 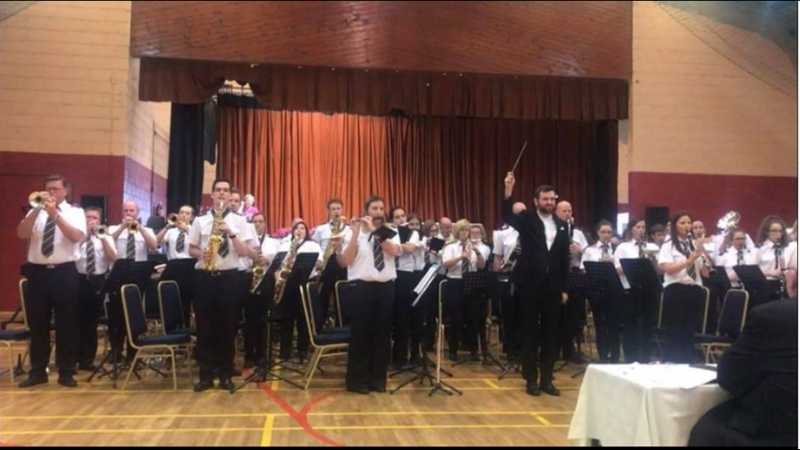 The AGM was held 12 February 2018. members, parents of younger members, supporters and friends of the band attended this very important meeting. Our Youth and Senior Bands will once again lead the Ardee Parade at 3pm on March 17th, an honor every Year.